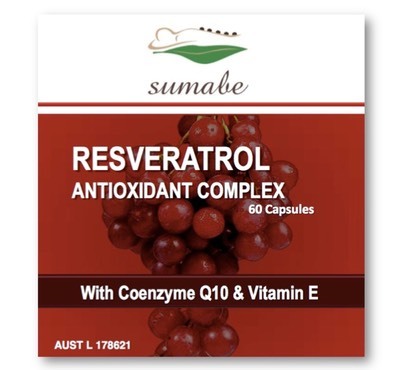 Sumabe® Resveratrol Antioxidant Complex contains the powerful antioxidants resveratrol, selenium, coenzyme Q10 and vitamin E, which assist in protecting the body from the damaging effects of free radicals. It helps to maintain the integrity of the cell membrane, aids normal tissue repair and assists in the maintenance of healthy skin. Resveratrol Antioxidant Complex supports the health of the cardiovascular system and heart and assists in the maintenance of healthy blood pressure and cholesterol in healthy people. It supports healthy visual function; helps maintain healthy immune function and may be beneficial during times of stress. Selenium is included and is a hepatoprotective mineral, which can support the health of the liver and protect the liver from potential oxidative damage, while coenzyme Q10 is involved in the production of ATP, or cellular energy. Resveratrol Antioxidant Complex supports health and general wellbeing as we age. Recommended dosage: Adults: Take 1 capsule daily with a meal, or as directed by your healthcare professional. Supports healthy visual function & healthy eye function. Helps eyes adapt to variations in light intensit & maintains healthy eyes. Protects & maintains health of capillaries. Helps to maintain the strength of the veins and capillaries & helps to maintain healthy venous tone. Supports & maintains the health of the cardiovascular system & supports blood circulation. Assists in the maintenance of healthy heart function. Supports the health of the blood vessels. Coenzyme Q10 may assist in maintaining normal, healthy blood pressure in healthy individuals. May assist in the maintenance of normal &/or healthy cholesterol levels in healthy individuals. Has antioxidant activity and therefore assists in protecting the body from the damaging effects of free radicals. Contains Resveratrol, which is an antioxidant that is also present in red wine. Helps to prevent free radical cellular damage. Selenium, resveratrol vitamin E & Coenzyme Q10 are powerful antioxidants and therefore may assist in protecting the cells in the body from oxidative damage. Selenium has a role in the antioxidant systems. Assists in protecting cells and tissues from free radical damage. Selenium is an important part of the enzyme glutathione peroxidise, & therefore is involved in the body’s antioxidant systems. Supports & maintains healthy immune function. Selenium supports the health & function of the immune system. Supports the production of ATP, or cellular energy. Contains Polygonum cuspidatum, which has a long history of use in Traditional Chinese Medicine to relieve symptoms of cough with phlegm & menstrual pain. Thyroid hormones increase basal metabolic rate, cellular metabolism and growth & development. Selenium plays a role in thyroid hormone production. Beneficial during time of stress. Selenium is a hepatoprotective mineral, which can support the health of the liver and protect the liver from potential oxidative damage. Maintains & supports the health of the liver. Coenzyme Q10 is found in the mitochondria of the body cells, where it plays an essential role in the electron transport chain and ATP synthesis. CoEnzyme Q10 is involved in the production of energy through its essential role in the electron transport chain. The amount of coenzyme Q10 in the body decreases with age. Helps to maintain the integrity of cell membranes. The antioxidant activity of vitamin E assists in protecting the polyunsaturated fatty acids in the cell membranes, and other critical cellular structures from lipid peroxidation, or free radical damage. Vitamin E is incorporated into the cell membranes and helps maintain their integrity throughout the body. Aids normal tissue repair and minor wound healing.